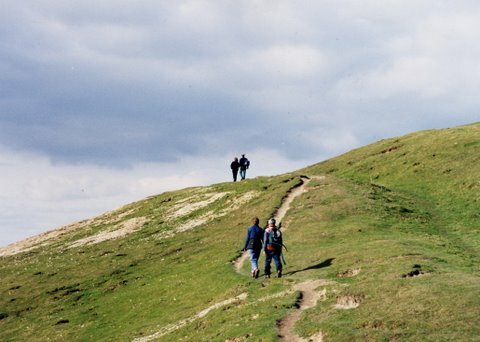 How do you measure Britain’s most popular walks? Footpaths may look busy, but it’s very difficult to count how many people are using them. And who’s to say it isn’t the same local people taking a turn every day of the year, which would certainly build up the numbers? Truth is, the countryside is not the sort of place where you can put up sensors to count the throng, as you would with traffic on the road. The National Trust has found another, and more helpful, form of measurement. They tell us that last year 350,000 walks were downloaded from the National Trust’s website – an increase of 40% on the previous 12 months. It’s as good a gauge as any, even if it does indicate that the walking public is a little cautious in its tastes. Still, it does like spectacular views. The Bath skyline walk is in first place, with its gorgeous views of the Georgian city. In second place is Alderley Edge in Cheshire, followed by Flatford Mill in Suffolk–famous for Constable’s landscapes. However, there is a contradiction. I wager that well over 95% of the people who take this beautiful countryside walk, in habitat of high nature value and conservationist intent, will have have travelled there by car. In high summer some buses call in, but generally public transport doesn’t even come close. Parking is free, so visitors only benefit conservation efforts if they buy refreshments at the cafe, by the monument. There is a far more environmentally-friendly option, open, literally, to millions. The 120 mile long Ridgeway National Trail, which runs from Avebury in Wilts, ends very close to here at Ivinghoe Beacon. It runs right outside Tring railway station. There are three trains an hour from Euston station, off-peak (fastest service 36 min), with an additional train direct from south London , and two trains an hour from the north. So in well under an hour from London visitors could be turning right out of the station and plunging into another part of the National Trust’s Ashridge estate, on a very well signed National Trail. After a mile or so the path opens up onto a spectacular remnant of high chalk download, Pitstone Hill, and continues to Ivinghoe Beacon. There’s an excellent recently-reopened village pub, the Rose and Crown, in the village of Ivinghoe. Then back to the train station and home, without troubling a petrol pump. So if access isn’t a problem, you might expect a multitude walking in Ashridge every weekend. My estimate is nearer a few dozen people. But then I did accept that it’s a perilous business counting people on foot paths. So let’s just enjoy the view. Click here for National Trust walks.